When you feel isolated and angry, and people are always staring, being introduced to Faith and Light brings you into a whole new family who accept, don’t stare, understand and share your feelings. My first feeling was excitement to be in this family. A family that would understand each other, and each others’ children. And who would empathise to my needs and feelings. 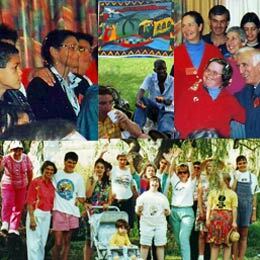 Faith and Light is an International community movement bringing together people with a learning disability, their families, carers, and friends, particularly young people. It recognises that every person has gifts to offer – the ability to welcome others with love and affection and a gift of celebration. The communities are non residential and meet together regularly to pray, to share, and to celebrate together. Friendships are formed and groups link to share outings and pilgrimages. The most important thing is to meet and listen to the man, woman, or child, who is often marginalized in today’s society. In this way we get to know each other and nobody is left out. Six communities are presently active in South Africa. Of these, three gather in the Johannesburg area, the communities at Victory Park, Maryvale and at Edenvale. The greater Cape Town area has three. In Bergvliet there is a community clustered on St. Martin’s, in Manenberg, the Holy Family community, and in Welcome Estate, St. Therese’s. Some of these communities have been active for over twenty five years.